This week we have awesome news for Ascension Online fans… Valley of the Ancients is live on the Ascension iOS, Android, and through Steam. This set marks the twelfth full Ascension expansion to be added to the app. Working on a game for this long, always forces us to ask the question: “How do we create something new and exciting, but that is still simple enough to learn and feels like Ascension?” In other words, how do you create something new and yet familiar? For Valley of the Ancients, I got to work with the set lead designer Ben Lundquist. This was Ben’s first lead design of an Ascension set, so it was great to see his influence and take on this question. Ben comes from a Professional Magic: the Gathering player background and you can see that influence in his design philosophy. The key focus in Valley of the Ancients was creating a high level of interaction between the players, and to do that, he came up with one of our more ambitious new mechanics: Temples. Your opponent can steal it. To make the Temples tug-of-war feel balanced, we needed to find a clear, familiar method to ensure players had fun with this new mechanic. This paved the way for a new resource in the game: Keystones. Keystones are…ahem…the keys to acquiring a Temple. There are many ways to gain Keystones: from Monsters to Constructs to Heroes. When you gain a Life or Death Keystone on your turn, you also gain access to the corresponding Temple. In other words, if a Temple is located in its designated space near the Center Row, you acquire it. However, if your opponent has a Temple, you steal it! 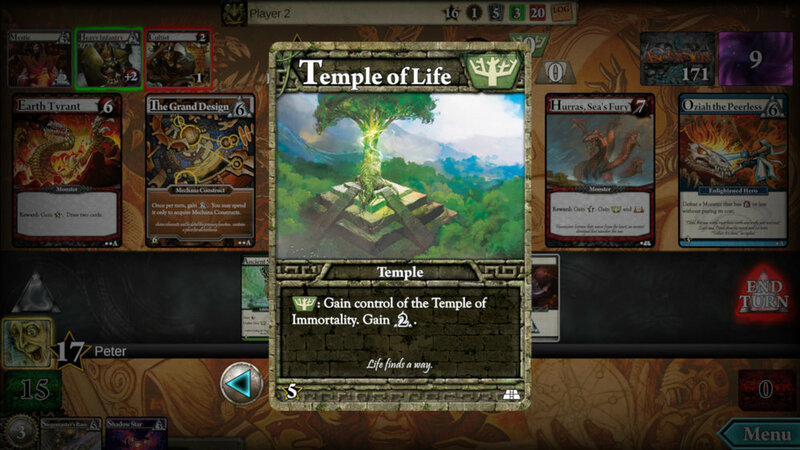 If you control the Temple of Life and the Temple of Death, then you can use Keystones to acquire the Temple of Immortality, which is the most powerful temple and a key resource to fight over through the course of play. In addition to a dramatic new mechanic like Temples, Valley of the Ancients also introduces more subtle mechanics like Serenity for Enlightened and Echo for Void. We loved these mechanics so much that we still include them in our more recent tabletop expansions like Ascension: Deliverance. Having keyword mechanics to define each faction helps provide more structure to the game, meaning sets like Valley of the Ancients help us refine our designs for the sets that follow after. We hope you love this new addition to the digital world of Ascension as much as we do and can’t wait to hear your thoughts and battle a bunch of you on the app!